07/04/15 -- Soycomplex: Beans closed a touch easier. Weekly export sales rebounded from last week's disappointment to 420,400 MT for 2015/2016 - in line with trade estimates. Exports of 322,500 MT were down 19 percent from the previous week and 54 percent from the prior 4-week average. A Bloomberg survey into trader/analyst sentiment in beans found 5 bulls, 18 bears and 1 neutral. The USDA's ag attache in Brazil was said to have predicted the 2016/17 Brazilian soybean crop at 103 MMT, a few million higher than most other trade forecasts. May 16 Soybeans settled at $9.04 1/2, down 3 1/2 cents; Jul 16 Soybeans settled at $9.12 3/4, down 3 1/4 cents; May 16 Soybean Meal settled at $266.80, down $1.10; May 16 Soybean Oil settled at 34.10, down 16 points. Corn: The corn market closed around 3 cents or so higher. Weekly export sales of 945,200 MT for 2015/16 were in line with expectations. Exports of 1,137,500 MT were a new a marketing-year-high for a second week running. The primary destinations were Mexico (371,400 MT), South Korea (129,200 MT), Colombia (129,000 MT), Taiwan (82,900 MT), Japan (82,800 MT), Peru (66,700 MT) and Saudi Arabia (65,400 MT). It may indeed be the case that Brazil is done on full season corn exports. A Bloomberg survey into trader/analyst sentiment in corn found 9 bulls, 10 bears and 5 neutral. The USDA attache's offices in South America peg Argentinean corn production of 31.5 MMT, and Brazilian production at 86 MMT. The official USDA estimates for 2015/16 are currently only 27.0 MMT and 84 MMT respectively. May 16 Corn settled at $3.61 1/2, up 3 1/2 cents; Jul 16 Corn settled at $3.64, up 3 1/4 cents. Wheat: The wheat market closed lower, kicked on it's way by weekly export sales of a negative 58,100 MT for 2015/16. There were sales of 159,300 MT were reported primarily for the Philippines (78,000 MT), South Korea (33,500 MT), Indonesia (25,000 MT) and Mexico (18,500 MT). Even so the two combined failed to meet trade total expectations of 250-550,000 MT. Egypt bought French wheat in their tender USD181.69/tonne FOB, or 194.34/tonne C&F, for May shipment, way below US price ideas. The USDA's ag attache in Argentina estimates their 2016/17 wheat crop at 14 MMT versus 11 MMT from the USDA themselves this season. There's talk of Brazil having a better 2016/17 wheat crop despite a drop in plantings. Neither would be good news for US wheat filling a void into Brazil as it has done the past couple of seasons. Jul 16 CBOT Wheat settled at $4.64 1/2, down 5 1/4 cents; Jul 16 KCBT Wheat settled at $4.65 1/2, down 6 3/4 cents; Jul 16 MGEX Wheat settled at $5.22 1/4, down 3 cents. 07/04/16 -- EU grains closed mixed, with Egypt's GASAC buying one cargo of French wheat late in the day. 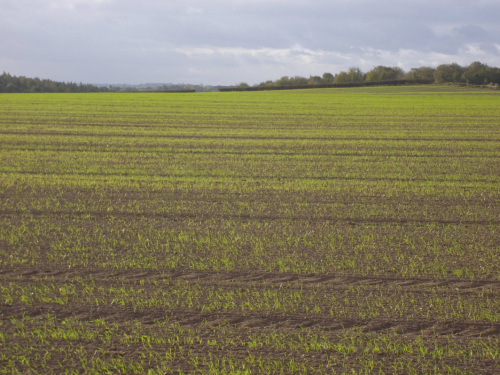 At the finish, front month May 16 London wheat was down GBP0.30/tonne at GBP106.30/tonne, May 16 Paris wheat was EUR1.00/tonne easier at EUR153.25/tonne, Jun 16 corn was up EUR2.25/tonne to EUR155.25/tonne and May 16 rapeseed was down EUR0.50/tonne at EUR368.50/tonne. Late on, Egypt booked just the one cargo of French wheat at USD181.69/tonne FOB, or 194.34/tonne C&F, for May shipment. Ukraine wheat was the best offer on an FOB basis at USD182.99/tonne, but missed out on freight (and possibly also quality?) considerations. The total volume put up for offer was relatively light, signalling seller caution over everything from late payment to constantly changing quality criteria with the buyer. Ukraine said that early spring grains were now planted on 77% of the Ag Min target for 2016/17. Most of this is spring barley on 1.3 million ha, or 67% of plan. Small areas of corn are now being planted, as indeed is also now the case in Southern Russia. Adverse autumn weather conditions slashed Ukraine's winter wheat plantings this year. Higher than normal levels of winter kill, and a dry late winter-early spring are also said to have had an adverse affect on crops there. More than half of the 2016 winter wheat crop may fail to make million standard this year, said one local analyst. That doesn't sound too bullish for London feed wheat in the first quarter or two of the new season. Algeria are tendering for 50,000 MT of optional origin wheat, but generally book far more than they tender for. France are typically the main supplier, but other EU nations and the Black Sea regularly compete for the business. 06/04/16 -- Soycomplex: Beans closed a tad higher. Informa pegged its 2015/16 Brazilian soybean production estimate at 100.5 MMT, down from its previous estimate of 101.3 MMT, but up from the USDA's 100.0 MMT forecast. Celeres today went for 99.9 MMT versus its March estimate of 99.1 MMT. Informa estimated Argentina at 59.5 MMT, up from its previous estimate of 59.0 MMT (USDA - 58.5 MMT). With demand switching to South America, trade estimates for tomorrow's weekly export sales report for beans are 200,000 to 550,000 MT. 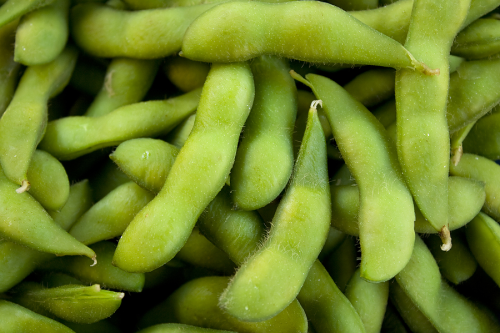 May 16 Soybeans settled at $9.08, up 3 1/4 cents; Jul 16 Soybeans settled at $9.16, up 3 1/4 cents; May 16 Soybean Meal settled at $267.90, down $0.80; May 16 Soybean Oil settled at 34.26, up 27 points. Corn: The market closed a tad firmer. Informa estimated 2015/16 Argentine production at 27.5 MMT versus a previous estimate of 27.0 MMT (the same as the USDA) and Brazilian production at 83.7 MMT (previous estimate: 82.5 MMT and USDA: 84.0 MMT). Celeres upped its Brazilian estimate from 87.1 MMT to 87.5 MMT. So it looks like there's some pretty big corn crops on the way from South America again this year as well as soybeans. Nevertheless, Dr Cordonnier still reports on short-term tightness in corn availability in Brazil before they start harvesting safrinha corn in June. 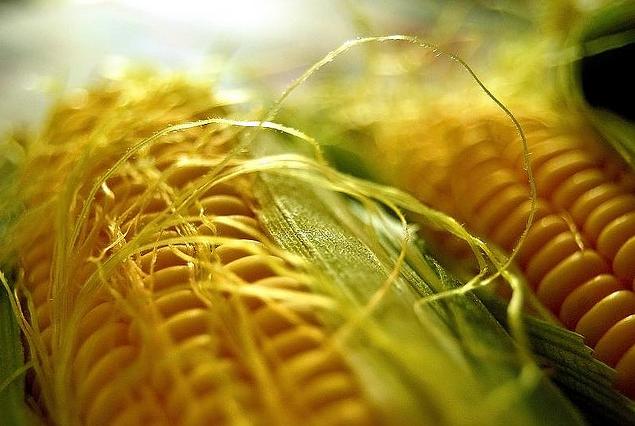 "Corn prices in the state of Sao Paulo reached as high as R$ 50 per sack of 60 kilograms recently, or approximately US$ 6.40 a bushel as reported by the Center for Advanced Economic Studies (Cepea)," he says. Trade estimates for tomorrow's weekly export sales on corn are 750 TMT to 1.2 MMT. May 16 Corn settled at $3.58, up 1 1/4 cents; Jul 16 Corn settled at $3.60 3/4, up 3/4 cent. Wheat: The wheat market finished the day with some fairly steep losses. Japan are in the market for 137,486 MT of Australian, Canadian, and US wheat in their routine weekly tender. Egypt's GASC are back looking for an unspecified amount of wheat for May 10-20 delivery with the results due tomorrow afternoon. US wheat is likely to be around $30/tonne about the best French/Russian offers. There's still talk of Russian and Ukraine dryness being a potential issue for wheat further down the line. The USDA last night reported US winter wheat conditions better than trade expectations and a year ago as if Sunday night. US exports are sluggish and their 2015/16 season which runs Jun/May is nearing an end. Exports to date suggest the US failing to meet the USDA's 2015/16 full season export target of 21.5 MMT. Export sales tomorrow are forecast 250-500 TMT. Jul 16 CBOT Wheat settled at $4.69 3/4, down 11 cents; Jul 16 KCBT Wheat settled at $4.72 1/4, down 12 3/4 cents; Jul 16 MGEX Wheat settled at $5.25 1/4, down 8 cents. Weak Sterling Proving Short-Term Opportunity Or Major Change Of Direction? 06/04/16 -- EU grains closed mostly a touch lower, with a stronger euro of little assistance to the Paris market. 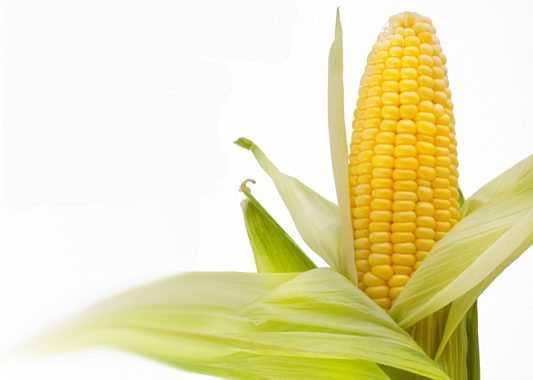 At the finish, front month May 16 London wheat was down GBP0.45/tonne at GBP106.00/tonne, May 16 Paris wheat was down EUR2.25/tonne to EUR154.25/tonne, Jun 16 Paris corn was unchanged at EUR154.00/tonne and May 16 Paris rapeseed slipped EUR0.25/tonne to EUR369.00/tonne. Sterling weakness relative to the euro is "influenced by data indicating slower UK economic growth in the first quarter of 2016 and also uncertainty over the approaching UK referendum on EU membership," says the HGCA. It's a pity that UK customs data is slow to let us know if UK exports have continued to be robust this past few months, after a relatively sluggish start to 2015/16 they picked up in Dec/Jan, but we are in the dark since then. Anecdotal data I am hearing would suggest that maybe exports have been better than expected. Watch this space. Carryover stocks at the end of 2015/16 will still be large, but maybe not quite as large as the trade was thinking before Christmas. Back then the banks were all forecasting the pound to outperform the euro, and even USD, in Q1 of 2016. Barclays for example had the GBP/EUR exchange rate at 1.45 in Q1 this year, some 15% below where we currently trade. Last night's close of 1.2388 was the lowest GBP/EUR valuation since June 2014. Many are now lining up to forecast a test of the 1.22-1.20 region in the coming weeks ahead. The sterling/euro exchange rate is expected to remain volatile in the months ahead and will continue to be an important influence of UK grain and oilseed prices," added the HGCA. There doesn't appear to have been any fundamental change in stance or market opinion as to the chances of a "Leave" vote succeeding, it's all just newspaper talk. This still smacks fairly heavily then of the Scottish "Yea/No" referrendum vote last year, and the turmoil this caused in the currency markets prior to "a race that was too close to call" rapidly proving to be anything but that. If the same happens again then don't rule out a rapid period of sterling appreciation, resulting in a sting in the tail for UK export hopes late in the season and to begin with in 2016/17. 05/04/16 -- Soycomplex: Beans closed lower, and appear to feel comfortable in the $8.50 to $9.25 region until the US gets this year's crop in the ground. Demand is certainly switching to South America - there's plenty of evidence in that, although that's not unusual either for the time of year. Fund money has set itself out to be long beans/oil and short meal. Weakness in Malaysian Palm Oil futures today had them unwinding some of those spreads, hence meal ending in mildly positive territory. May 16 Soybeans settled at $9.04 3/4, down 8 3/4 cents; Jul 16 Soybeans settled at $9.12 3/4, down 8 3/4 cents; May 16 Soybean Meal settled at $268.70, up $0.50; May 16 Soybean Oil settled at 33.99, down 70 points. Corn: The corn market closed a couple of cents firmer, continuing to rebound a little from the sharp sell-off seen following the USDA's bearish planting intentions numbers released Thursday. Dry weather in Brazil is helping advance harvest progress for full season corn, but is creating some concern for second crop corn stress. These days the so called safrinha, or second corn crop, contributes a far larger volume to Brazil's overall annual corn supply than full season corn. Safras says that the Brazilian full season corn crop is 76% harvested, versus 60% at this time last year. The US Energy Dept release their weekly ethanol production numbers tomorrow. Last week they had output at 992,000 barrels per day, down 3,000 bpd from the previous week. May 16 Corn settled at $3.56 3/4, up 2 1/4 cents; Jul 16 Corn settled at $3.60, up 2 1/4 cents. Wheat: The wheat market closed a touch easier across the three exchanges. After the close the USDA gave us the first weekly crop ratings of the year, estimating US all wheat at 59% good to excellent. That's 4 points ahead of the average trade guess and versus only 44% this time a year ago. The five-year average for this time is said to be only 42%. Washington (87% G/E) is the top rated, followed by Ohio and California (85%). The top producing state of Kansas is 55% G/E. 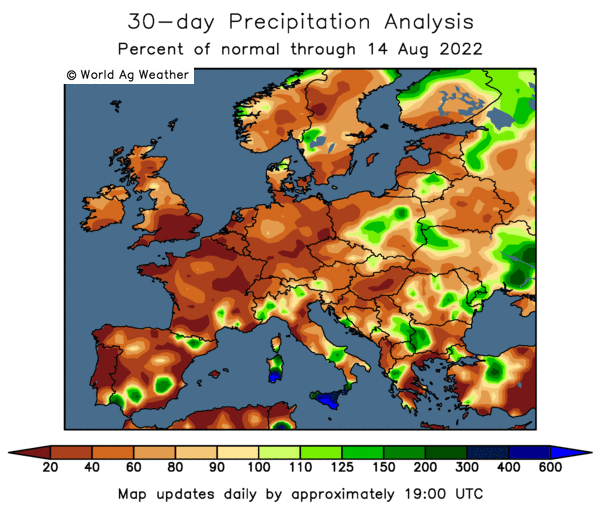 Heat/dryness worries in Russia and Ukraine are ringing a few alarm bells. Temperatures and rainfall there are set to be well out of sync with normal for the next couple of weeks. Ethiopia were said to have bought 499,536 MT of optional wheat, most likely from the Black Sea region, in a tender. Tunisia are in for 42,000 MT of optional durum wheat. Jul 16 CBOT Wheat settled at $4.80 3/4, down 1/2 cent; Jul 16 KCBT Wheat settled at $4.85, down 1 1/2 cents; Jul 16 MGEX Wheat settled at $5.33 1/4, down 4 3/4 cents. 05/04/16 -- EU grains closed mixed. 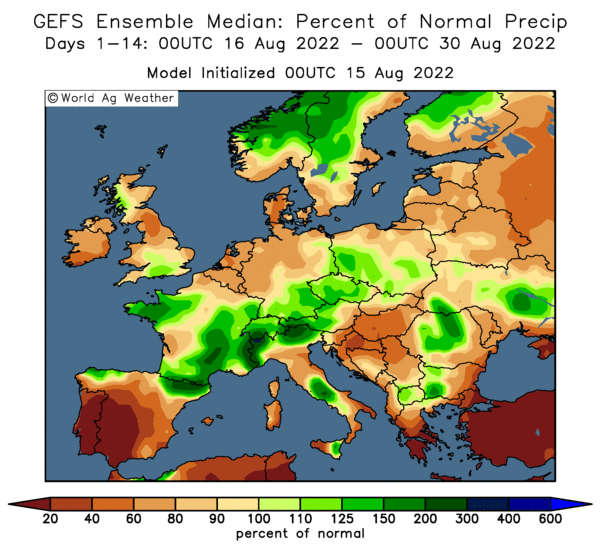 Trade talk of much warmer than normal temperatures across most of Europe, and heat/dryness issues too in the weeks ahead for Russia and Ukraine are supportive for now. At the finish May 16 London wheat was GBP0.85/tonne higher at GBP106.45/tonne. May 16 Paris wheat gained EUR1.25/tonne to EUR156.50/tonne, corn added EUR1.50/tonne to EUR154.00/tonne and rapeseed closed a euro weaker at EUR369.25/tonne. Lower wheat production prospects for both Russia and Ukraine this year are getting some attention. "However, these concerns alone do not appear large enough to be game-changers," said the HGCA - at least not yet anyway. The latest GFS model weather run shows the area of "drier than normal" to be more extensive than it was yesterday. At the same time the GFS model is now forecasting temperatures in the 10-15C higher than normal bracket. The areas set to see the highest temps and least rainfall are significant wheat producing regions. The forecast for Europe is generally favourable for the coming weeks. Tunisia are tendering for 42,000 MT of durum wheat and Ethiopia for 70,000 MT of soft wheat, both of optional origin. The USDA's FAS said that Tunisia's wheat crop this year would rise 21% to 1.1 MMT, cutting imports to 1.7 MMT in 2015/16. They also estimated that Morocco's wheat crop would more than halve to 3.74 MMT due to reduced plantings and unfavourable heat/dryness throughout the season. Wheat imports in 2016/17 could rise 20% to 3.9 MMT, they said. 04/04/15 -- Soycomplex: Beans closed lower. Weekly export inspections of 204,974 MT were the lowest for some time, and down by almost 2/3rds on a week ago and a year ago. A report on Reuters indicated that Chinese farmers may increase soybean acreage by 10% this year due to the government's move to reduce support levels on corn. Ag Rural said that 76% of the Brazilian soybean crop has been harvested, and that an estimated 60% of it is sold, versus 53% at this time a year ago. Demand is clearly switching to Brazil. They logged 30% greater exports in March versus a year ago and that is expected to continue through this month. Worker disputes, strikes and/or other port delays due to machinery breakdown/weather and Acts of God etc have been relatively minimal so far. May 16 Soybeans settled at $9.13 1/2, down 4 3/4 cents; Jul 16 Soybeans settled at $9.21 1/2, down 4 1/2 cents; May 16 Soybean Meal settled at $268.20, down $4.10; May 16 Soybean Oil settled at 34.69, up 24 points. Corn: The corn market closed relatively flat. Weekly export inspections of just over 1 MMT were in line with recent performances. Season to date inspections are 16% down on this time a year ago. The market is still wondering how realistic the USDA's 93.6 million acres spring planting estimate for corn will be. The USDA themselves are due to begin reporting on corn planting progress tomorrow. It's a bit early for beans just yet. A cooler, wetter outlook will likely impede fieldwork progress a bit over the next couple weeks. Russia reported that they'd exported 3.8 MMT of corn so far this year, and are on target for a record volume of foreign sales in 2015/16. Ukraine won't set any records, but their corn shipments for far in 2015/16 are strong at 13.4 MMT. They are also expected to "go large" with corn plantings this spring due to a large increase in unsown winter crops. Brazil's corn exports have been running at a record pace too, but there are now signs of these slowing up, and actually being replaced by imports as hog producers squeal for supplies. Corn imports from Argentina in 2016 should be the highest in 15 years, says Dr Cordonnier. May 16 Corn settled at $3.54 1/2, up 1/2 cent; Jul 16 Corn settled at $3.57 3/4, unchanged. Wheat: The wheat market closed narrowly mixed. Weekly export inspections came in at 318,348 MT - in line with trade forecasts. YTD inspections are now 12.3% behind the pace of the 2014/15 marketing year and are only supposed to be 5.5% down by the end of it on May 31, so this now looks a touch unlikely. Crop progress is delayed until tomorrow. The trade is expecting 55% of the national winter wheat crop to be in good to excellent condition versus 58% this time last year. Dr Cordonnier reported that Brazil's wheat production in 2016/17 could rise despite lower plantings (down 9.5%). This could be the result of better yields and improved quality if the weather plays ball. Both yields and quality have been hid badly in the last two years. Production could rise 14% to 6.3 MMT, according to local analysts Trigo & Farnihas, he says. US wheat has picked up some good business on the back of these problems in recent year. They'd like to have those chances again. EU, Russian and Ukraine wheat exports continue brisk, keeping US export chances restricted. Jul 16 CBOT Wheat settled at $4.81 1/4, down 1 3/4 cents; Jul 16 KCBT Wheat settled at $4.86 1/2, down 2 cents; Jul 16 MGEX Wheat settled at $5.38, unchanged. 04/04/16 -- EU grains closed mixed, with rapeseed continuing to get support for strong US soybeans and lower world OSR production estimates again this year. 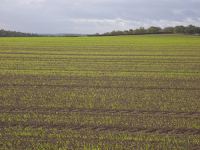 At the finish, front month May 16 London wheat was down GBP0.40/tonne at GBP105.60/tonne, May 16 Paris wheat was EUR3.75/tonne easier at EUR155.25/tonne, Jun 16 corn was down EUR4.75/tonne to EUR152.50/tonne and May 16 rapeseed was up EUR2.00/tonne at EUR370.25/tonne. Reported late from Friday was that the EU issued 969 TMT worth of soft wheat export licences last week, down 8.2% from the previous week but still a respectable number. The total volume to date is now 22.16 MMT, a 13% decrease on a year ago - recall the USDA has full season all wheat exports for the EU-28 declining by 8.25% in 2015/16. Barley export licences last week were only 87 TMT, although the season to date total of over 8 MMT is still a 17% advance on this time a year ago. The USDA currently has these down 15.4% year-on-year. 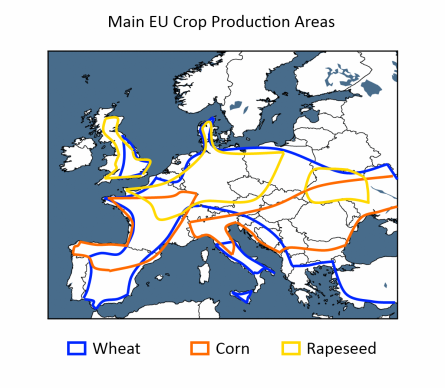 Europe is then making some room for new crop as and when it comes along, Lord knows we will need it. Russia and Ukraine aren't letting the grass grow under their feet either though with regards to that respect. In Russia meanwhile, grain exports for the season to date total 28.08 MMT, of which 20.58 MMT is wheat, 3.88 MMT barley and 3.80 MMT corn. Early spring plantings in Ukraine meanwhile are 60% done on 1.5 million ha. Russia is only 2% done, in line with last year. The GFS Model had Russia and Ukraine getting temperatures 2-10 degrees C above normal for the next two weeks, although other weather models are showing things not quite so out of ordinary with "normal" for this time of year. Central areas of the region are drier than normal too, which warrants keeping an eye on. 01/04/16 -- Soycomplex: Beans closed at new highs for the move, The IGC estimated world 2015/16 soybean production 2 MMT higher than a month ago ago 323 MMT, but cut consumption amongst major exporters by 5 MMT to 22 MMT. For 2016/17 they see global output at 329 MMT, with inventories dropping to 18 MMT. Buenos Aires Grain Exchange increased its Argentine soybean production estimate to 60 MMT from 58 MMT. The weekly commitment of traders report has managed money increasing their net soybean long for the week through to Tuesday night by by almost 22k lots to 75k contracts. The USDA today said US processors crushed 4.64 MMT of soybeans during February, down from 4.81 MMT in January. (Presumably due to seasonal factors, a shorter month etc). May 16 Soybeans settled at $9.18 1/4, up 7 1/2 cents; Jul 16 Soybeans settled at $9.26, up 8 1/4 cents; May 16 Soybean Meal settled at $272.30, up $2.00; May 16 Soybean Oil settled at 34.45, up 23 points. Corn: The market closed a couple of cents or so firmer. Yesterday's traded volume in Chicago corn set a new all-time daily record by all accounts. The bearish after-effects of yesterday's USDA acreage report may take some working off just yet. The CFTC reported managed money on the wrong side of this move, trimming their net short position by 465k lots to around 108.5k contracts as of Tuesday night. Oil World estimated 2017 Argentinean corn production at 33 MMT next year, presumably envisaging a return to more "normal" crop rotation under the new government with export duties and quotas now removed. The IGC raised global 2015/16 corn output by 3 MMT to 972 MMT, with ending stocks unchanged at 206 MMT. For 2016/17 they see the world crop at 993 MMT, a jump of 2.16%, with stocks little changed at 58 MMT. South Korea were reported to have bought 272,000 MT of corn of optional origin today. May 16 Corn settled at $3.54, up 2 1/2 cents; Jul 16 Corn settled at $3.57 3/4, up 2 cents. 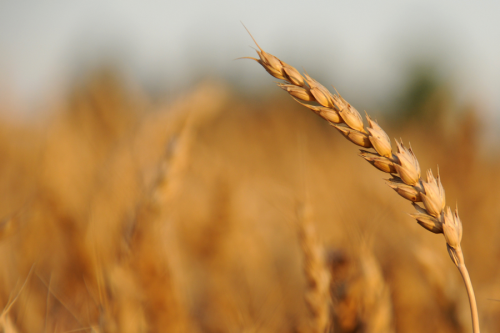 Wheat: The wheat market closed a touch higher on the day and with decent gains for the week. The USDA appeared to confirm yesterday that ultimately the cure for low prices is low prices, with US growers planting the smallest all wheat acres for the 2016 harvest since 1970. The Rest of the World look like following suit, but to a lesser degree. World wheat production in 2016/17 was estimated at 713 MMT by the IGC, down 2.9% versus this season. Reduced consumption though means that ending stocks amongst the major exporting nations will only decline by 3 MMT to 67 MMT. This season's wheat ending stocks meanwhile are estimated at a 29-year high, they said. Managed money took 12k lots off their overall short in Chicago wheat for the week through to Tuesday night, leaving them net short just under 70k contracts. Jul 16 CBOT Wheat settled at $4.83, up 2 1/4 cents; Jul 16 KCBT Wheat settled at $4.88 1/2, up 1 1/2 cents; Jul 16 MGEX Wheat settled at $5.38, up 1/4 cent. 01/04/16 -- EU grains closed almost universally higher across the entire board. All ended net gainers for the week too, although trade has been choppy. 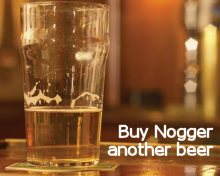 At the finish, front month May 16 London wheat was up GBP1.00/tonne at GBP106.00/tonne, May 16 Paris wheat was up EUR2.50/tonne to EUR159.00/tonne, Jun 16 Paris corn was up EUR2.50/tonne to EUR157.25/tonne and May 16 Paris rapeseed rose EUR4.25/tonne to EUR368.25/tonne. For the week, May 16 London wheat wheat was up GBP1.00/tonne, Paris wheat gained GBP2.50/tonne, corn added EUR1.50/tonne and rapeseed EUR4.25/tonne. FraneAgriMer pared back their French winter wheat crop ratings by 1 percentage point in the top two categories to 92% (versus 91% a year ago). Winter barley ratings also came in at 91% good to very good, unchanged on a year ago. Nevertheless this is still a pretty impressively high number. 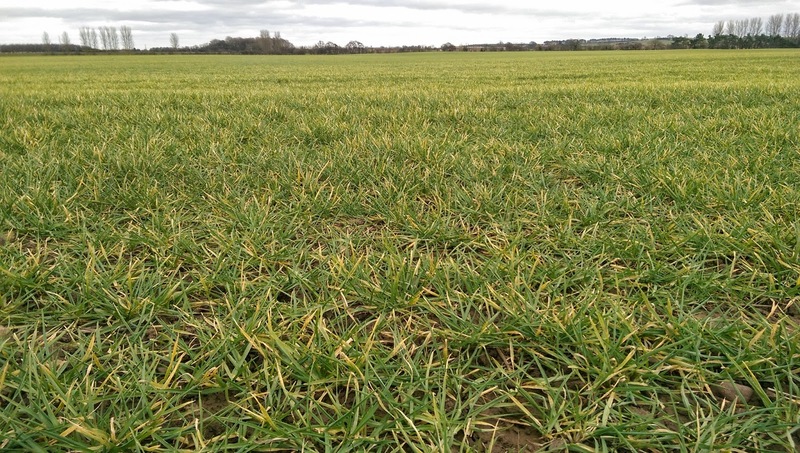 Spring barley plantings in France were estimated at 98% complete versus 90% a week ago, with 85% of the crop emerged compared to 70% this time last year. 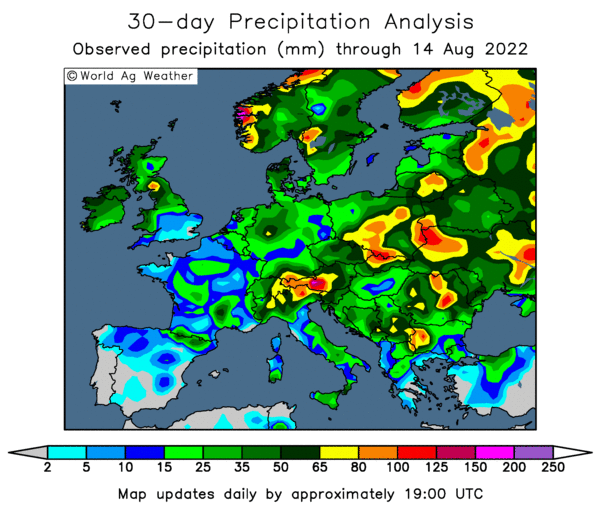 The week ahead has almost all of Europe picking up better than average rains, apart from very far eastern areas. Average daily highs are seen generally well above normal, save for Spain, Portugal,the UK and western half of France. Grain exports are still pouring out of Ukraine and Russia. The former has now exported 30.2 MMT of grains, including 12.9 MMT of wheat, 13.4 MMT of corn and 4.04 MMT of barley, say the Ag Ministry there. Rusagrotrans said that Russia could have exported 2.7 MMT of grains in March (up from an earlier estimate of 2.5 MMT), and might ship out another 2.15 MMT this month (up from the 1.8-2.0 MMT forecast previously). Russian corn exports are now accounting for a decent percentage of these monthly totals (28% rising to 30-33% in April). Looking ahead into 2016/17. the IGC forecast world wheat production at 713 MMT, down nearly 3% form this season. A rise in corn output will however make up for most of that, with a 2.2% increase from 972 MMT to 993 MMT. World 2016/17 wheat stocks are seen down 3 MMT on this season at 67 MMT, and corn stocks down 1 MMT to 58 MMT.